Gossip Slots Casino will then reward you with a bonus (Welcome Bonus is for new players only). The terms and conditions of the bonuses vary between different casinos and might also change over time and between different countries, so it is important to compare the different offers and read the T&C for Gossip Slots Casino before signing up. Established in 2013, Gossip Slots Casino is an online casino offering some of the best 3D slots on the market. Its name may strike you as a bit odd, but the truth is that you can really chat and spread rumours with your fellow players while enjoying a wide range of casino games thanks to chat rooms. 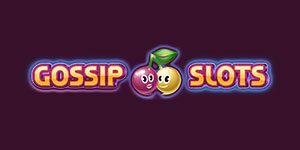 With an amazing welcome package of $8,000 or 600 free spins offered to all new members and allowing them to choose their preferred options, Gossip Slots will make your stay enjoyable from the moment you join it. Licensed by the Government of Curacao, the gaming venue is a safe and fair gambling destination with customer support service available via multiple communication channels. Gossip Slots runs on the platform powered by Betsoft Gaming. Besides the gaming content supplied by this developer, you can also play the games from Arrow’s Edge, a relatively young software provider dedicated to the production of high-quality casino products. The casino’s portfolio houses more than 160 casino games and all of them are available in instant-play mode. The majority of the titles are optimized for mobile play too, so you can enjoy them and win wherever you are. Betsoft is well-known for their collection of top-notch 3D video slots and here you can find them all. The titles like The Slotfather or Mr. Vegas will provide you with a cinematic gaming experience and multiple opportunities to win. When it comes to the content supplied by Arrow’s Edge, their releases boast impressive visuals and sounds combined with innovative and lucrative bonus features that will most certainly keep you glued to the screen of your computer, tablet or smartphone. Give Robin in the Woods or License to Spin a try and see for yourself. A selection of classic slots is also available. Under the Table Games section, you can find Blackjack, Roulette and Poker tables. There are more than 20 virtual tables you can join and use a proper strategy to beat the house. If you are a high-roller, you can join the tables designed for players with deeper pockets. They are in a separate section featuring even 10 VIP Blackjack and Roulette tables. Cash Grab, Single Hand, Pyramid and Multi-Hand Video Poker variations are also on offer along with Specialty Games such as Keno variants, Scratcherz and Virtual Racebook 3D. Unfortunately, Gossip Slots offers no live dealer games. Upon registration, you will be offered to choose from two welcome bonus options. You can claim either 250% up to $2,000 or 150 free spins on each of your first 4 deposits. You can also make a combination of welcome bonuses and free spins. If you opt for free spins, you are allowed to pick slots you will use them on. To qualify for bonus cash, you have to make a minimum deposit of $25 while free spins require a deposit of $50. Wagering requirements for both options are set at 60x. Once you have used up all four welcome bonuses, you’ll enter the Gossip Slots Club bonus program offering reload bonuses on every deposit, including weekly and seasonal special promotions. Among the ongoing promotions, you can also find daily offers, weekly rebates, Facebook and Twitter promotions and the VIP rewards plan with instructions on how to redeem your loyalty points and turn them into bonus credits. All slot enthusiasts can join tournaments with a prize pool of $30,000 on a monthly basis. Tournaments can be joined from desktop and mobile devices. Play against fellow competitors from all corners of the world and secure the best ranking on the leaderboard for the top prize. Besides slots, tournaments are held on the table and card games like VIP Blackjack or Single Hand All American Poker. 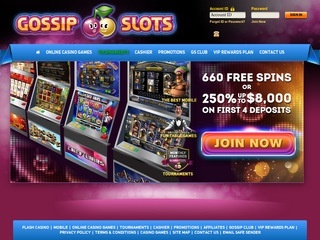 At Gossip Slots Casino players can choose from multiple banking options to fund their accounts and withdraw from them. They include Visa, MasterCard, Bitcoin, Skrill, Neteller, DirectCash and QuickCash. A minimum amount you can deposit to your account is $25 while a minimum withdrawal depends on a selected method and varies between $100 via Bank Wire and $330 via DirectCash and QuickCash. The maximum withdrawal allowed is $2,500 and cashouts can take up to 12 business days. The only currency accepted by the gaming establishment is US dollar. If you have any troubles while playing at Gossip Slots Casino, you can contact the customer support team ready to help you Monday to Sunday between 9am and 3am EST. The communication channels include live chat, email and phone with Australia and US lines available. Besides, in the footer of the website, under the Sitemap section, you can find more on the casino policy. The casino is also present on the social networks Facebook and Twitter where they share updates on the latest promotions and activities customers can take part in.